Eremobates drachmani Muma 1986: 10; Muma 1987: 10; Muma, 1989: 15; Brookhart & Brookhart 2006: 305. 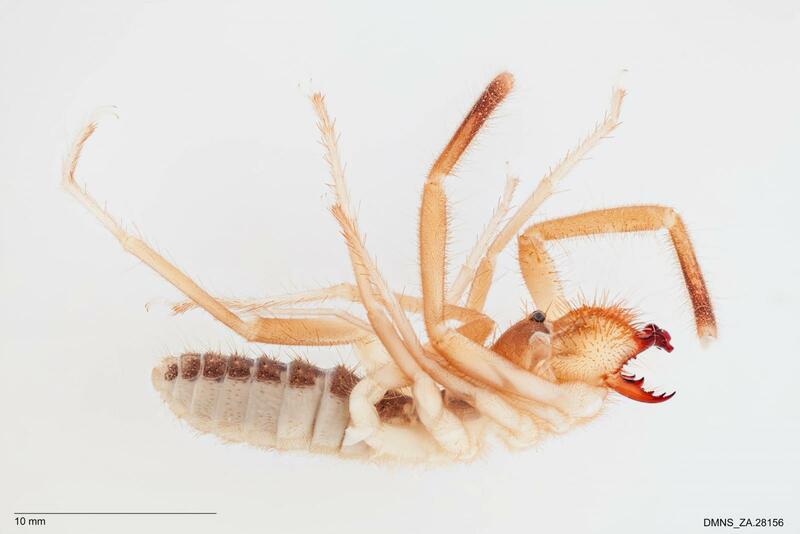 Medium-sized eremobatine solifuge with shovel-like termination of fixed cheliceral finger (see above) typical of genus, a palpal scopula, and four ctenidia on first post-spiracular sternite. Differs from E. sculpturata (the only other known member of the genus), in the latter two characters (E. sculpturata bears six ctenidia and lacks a palpal scopula). Male holotype on patio at Neuva Guaymas, Sonora, Mexico, October 1969, by Grace Drachman deposited in the American Museum of Natural History. the femur. Females are unknown . MALE HOLOTYPE: Total length, 25.0 mm. Coloration in alcohol similar to that of E. sculpturata except that the palpi are dusky on the tarsi, metatarsi, and tibiae, and both leg 3 and leg 4 are dark laterally on the tibiae and most of the femora. Structure essentially as in sculpturata. Dentition as shown in figures 23 and 24. Palpus provided with a scopula of 80 plus or minus papillae on the metatarsus. First post-stigmatic abdominal sternite with 4 flattened sword-like ctenidia, figure 25. Other structures the same as for sculpturata and probably of generic importance only. "REMARKS: This species becomes the second known species of the genus. Eremothera barberi Muma (1951) has been moved by Brookhart and Muma (1981) to the pallipes species-group of Eremobates." Type material.—Male holotype from Nueva Guymas, Sonora, Mexico (AMNH). Recorded specimens.—Known from type only. This species has been found to co-occur with Eremothera sculpturata in Catalina State Park, Pima County, Arizona. The known distribution of the two species is similar..